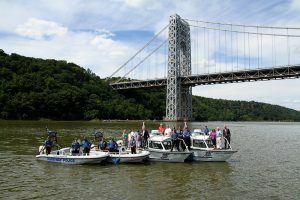 In July 2015 the Palisades Interstate Parkway Police Department announced the re-creation of the Marine Operations Bureau. Originally created in 1908 with the start of the department’s history, the department has long been responsible for patrols in the Hudson River from Edgewater New Jersey into New York State. Responses have ranged from maritime only in nature to also land emergencies such as lost and injured hikers as well as rescues and recoveries from the cliff side. Members of the M.O.B. undergo 120 hours of Vessel Operator Training and each member of the department undergoes a Basic Marine Law Enforcement Course. This allows anyone to respond to an emergency regardless of their assignment to the bureau. Additional training is also offered to the members to advanced their professional development in maritime public safety. The 120 hours is divided between night and day time hours. It includes intensive hands-on training in not only vessel operation, but mechanics, rescue and enforcement operations, docking, mooring, and line procedures, personnel transfers in motion, navigation, and area familiarization. The Basic Marine Law Enforcement Course is instructed by the NJ State Police and is NASBLA approved. The Palisades Interstate Parkway Police Department is proud to announce the creation of its new Bicycle Unit. The Bicycle Unit will be an integral part of patrol operations within the department as it allows officers more advantages with public outreach and response. 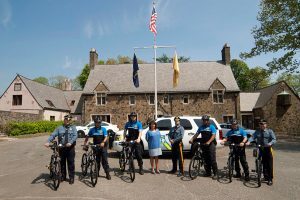 The officers will gain mobility in their patrol operations by reaching more remote locations in less time but also allow them to patrol more crowded areas where patrol vehicles are impractical.The New Jersey section of the Palisades Interstate Park is the region’s most active concentration of bicycle activity on both amateur and professional levels. The new unit will allow the officers to connect with the cycling community on a more common ground and bring more safety awareness to riders.